The United States targeted Venezuela's government with new sanctions on Monday and called on allies to freeze the assets of its state-owned oil company PDVSA after deadly violence blocked humanitarian aid from reaching the country over the weekend. As Colombia's foreign minister warned about "credible threats to the life" of Venezuela's opposition leader and self-declared interim president Juan Guaido, the Trump administration also took its pressure campaign to the United Nations Security Council, asking it to discuss the situation in Venezuela, diplomats said. The sanctions directed at four Venezuelan state governors the U.S. views as sympathetic to President Nicolas Maduro coincided with U.S. Vice-President Mike Pence's speech in Bogota to the Lima Group, a bloc of nations from Argentina to Canada dedicated to peaceful resolution of the political and economic crisis in Venezuela, in which he said the U.S. was readying an additional $56 million US in humanitarian aid. On a call to reporters Monday evening following the meeting, Foreign Affairs Minister Chrystia Freeland said Canada is talking to its partners about expanding sanctions on the Venezuelan government. "We have put many of the senior leaders in the Maduro regime on our sanctions list. We are discussing with our partners now ways that that sanctions list can be expanded in order to have even more bite," she said on the call from Bogota. She also said work is being done to plan for a post-Maduro recovery. "Work is very much underway at quite a high level of detail on ways to support Venezuela the day after the democratic transition. I think medium and long term, Venezuela's prospects are excellent, but there is a crisis today and part of our responsibility is to help the interim government have a really clear and effective plan." 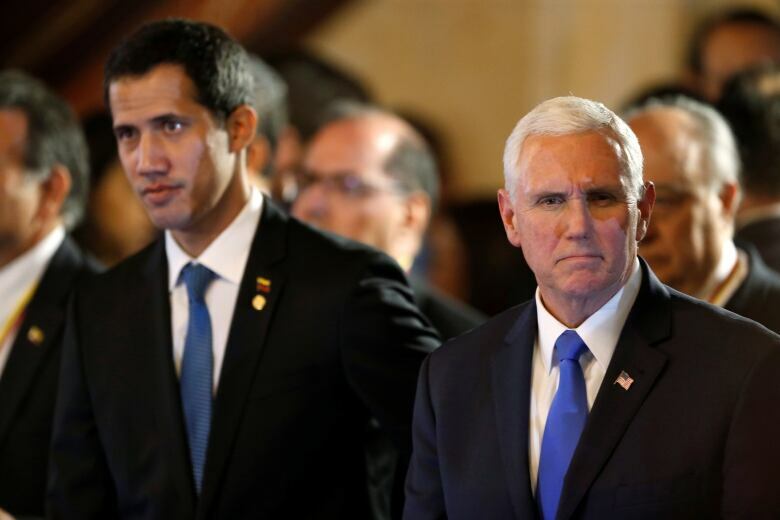 Earlier, Pence urged Latin American allies to increase pressure on Maduro's government and recognize the interim government of Guaido, who was in attendance. "We call on all Lima Group nations to immediately freeze the assets of PDVSA," he said, referring to the state-owned oil company. "Secondly, transfer ownership of Venezuelan assets in your country from Maduro's henchmen to President Guaido's government." Pence also called on the countries to restrict visas for officials close to Maduro and to vote to recognize the representative of Guaido at the Inter-American Development Bank. Freeland, who has been instrumental in the formation and progress of the Lima Group, which includes 13 Latin American countries, said Monday's meeting would build on the work Canada and the partners in the Lima Group were doing to "support the people of Venezuela in their fight for freedom and democracy." "For the past two years, the world has watched with great concern as Venezuela, under Nicolas Maduro's rule, has descended into chaos," Freeland said in a statement late last week. "Throughout all of this, the international community has been vocal in standing up for the rights of Venezuelans. The meeting Monday came after convoys of aid were blocked at the Venezuelan border in recent days by forces and gangs loyal to Maduro. 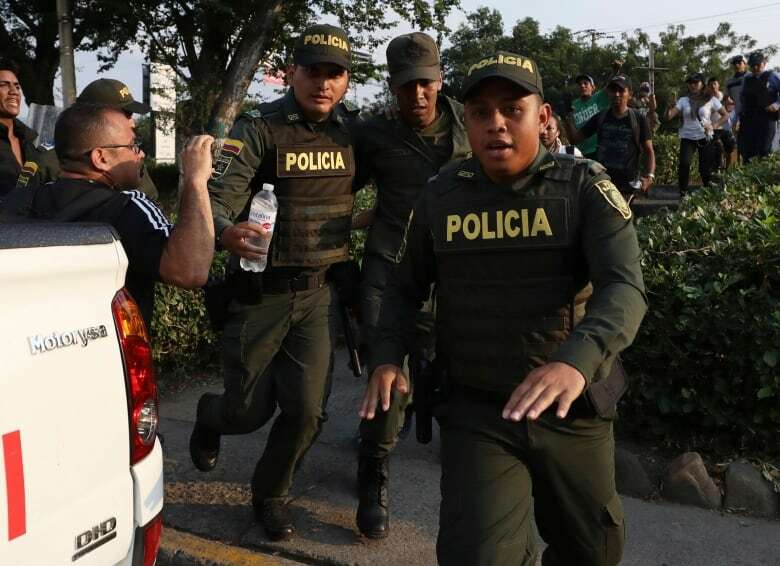 Separate clashes between protesters and Venezuelan troops took place near the country's border with Colombia and Brazil, with dozens injured and at least four reported killed. The day began with Guaido urging "all options" be considered to remove Maduro, but the threat of military intervention seemed weaker after the meeting. 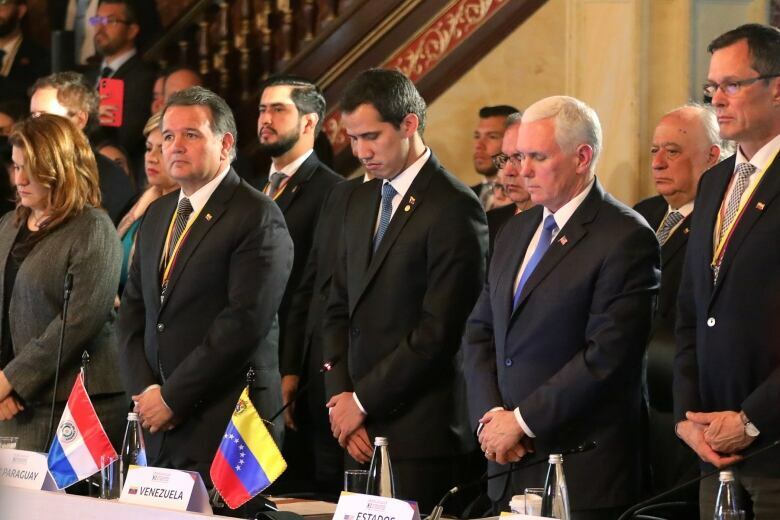 Guaido, sitting next to Pence at the meeting, asked for a moment of silence for those killed in what he called the "massacre" of the weekend. Colombian Foreign Minister Carlos Holmes Trujillo, speaking on behalf of the Lima Group, said Guaido himself could be in danger from the Maduro regime. "There's information about serious and credible threats to the life and integrity of Juan Guaido and his family, as well as to his wife's family. From Bogota, we want to hold the usurper Maduro responsible for any violent action against Guaido, against his wife and against their relatives,"
When the group met in Ottawa earlier this month, Canada pledged $53 million in humanitarian aid and development support, focused on the needs of Venezuelans who have fled the country. On Friday, UN refugee and migration agencies said some 3.4 million people have now fled Venezuela, up from a November estimate of three million. Pence in his speech thanked the Colombian government of Ivan Duque, which has borne the brunt of the exodus. Colombia hosts the highest number of Venezuela migrants — more than 1.1 million — according to the latest figures released by the UNHCR and the International Organization for Migration, followed by Peru with 506,000 and Chile with 288,000. Brazil has taken in 96,000 Venezuelans. Canada, the United States and most other Western nations no longer recognize Maduro as the country's leader. 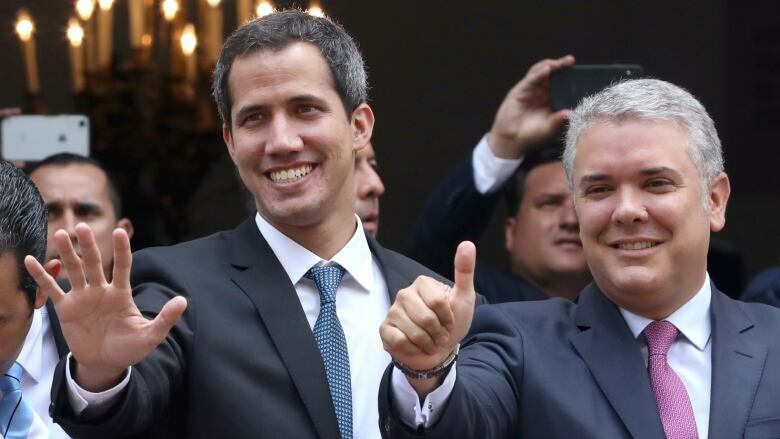 U.S. President Donald Trump and other Western leaders have recognized Guaido, the head of Venezuela's national assembly, as interim president. Pence also called for Mexico and Uruguay, two left-leaning regional governments, to join most of the region's other powers in embracing Guaido as Venezuela's rightful president. He also repeated an earlier statement that there would be an amnesty for members of the armed forces who throw their support behind Guaido. He said he hoped Maduro and those supported by his "corruption and his brutality" will leave Venezuela peacefully. "We make clear to them that we will support the interim president's call for amnesty, an inclusive government, an inclusive future for members of the armed forces who have laid down their arms and stand with the Guaido government," Pence said. So far, fewer than 200 military troops have deserted the Venezuelan military. Unlike the Lima Group, of which the United States is not a member, the Trump administration has so far declined to rule out the use of military force. But Hugo de Zela Martinez, deputy foreign minister of Peru, denied there was any division in the group over the use of force. Omar Jose Prieto, governor of the northwestern state of Zulia that borders Colombia. Ramon Alonso Carrizalez, governor of the state of Apure and a former defence minister. Jorge Luis Garcia, governor of Vargas state and former head of the army. Rafael Alejandro Lacava, governor of Carabobo state and ally of Maduro. "The illegitimate Maduro regime's attempts to blockade international aid intended for the Venezuelan people are shameful, U.S. Treasury Secretary Steven Mnuchin said in a statement. Pence said in the days ahead, the U.S. would announce "even stronger sanctions on the regime's corrupt financial networks." "We will work with all of you to find every last dollar that they stole and work to return it to Venezuela," he said. Maduro retains the backing of both Russia and China. Beijing has lent more than $50 billion to Venezuela through oil-for-loan agreements over the past decade, securing energy supplies for its fast-growing economy. "We again call on the government and opposition in Venezuela to seek a political resolution under the framework of the constitution and law, and call on the international community to do more that really benefits Venezuela's stability, economic development and improvement in livelihoods," China's Foreign Ministry said on Monday. China "hopes the international community can provide constructive help to Venezuela under the precondition of respecting Venezuela's sovereignty," it added.